Highly attractive erect fat spikes in deep purplish red, from 3 inch thick tapering to 1 inch, as if standing guard. Ideal as a border filler, and for flower arranging. 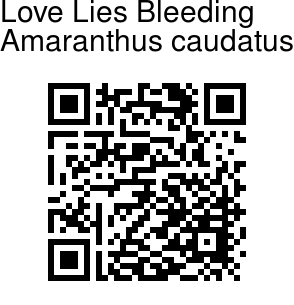 Love-lies-bleeding gets its unusual common name from its tiny blood red petalless flowers that bloom in narrow, often drooping, tassel-like, terminal and axillary panicles throughout the growing season. Native to tropical America, this is an annual that usually grows 2-4 ft tall. Cultivars with yellow-green flowers are also available. Oval, light green leaves (to 6 in long) The seeds of this species are edible, and species plants are grown as a grain crop in some parts of South America. 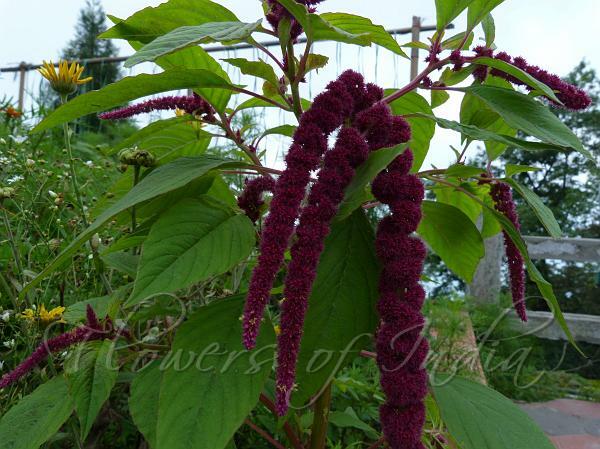 This plant is everlasting (Amaranthus comes from the Greek word for unfading) whose flowers retain some color when dried for arrangements.